Yorkshire was the location of many potteries during the 18th and 19th centuries and details can be found in John D. Griffins new book The Yorkshire Potteries, 2012. Some, such as Leeds, Don, Castleford, Ferrybridge, Mexborough and Swinton are familiar to collectors and Kilnhurst already has its own page on Brownjugs. However Yorkshire brown sprigged saltglaze presents some problems. There are only two accepted makers, Wibsey and Eccleshill, both near Bradford in West Yorkshire The problem is the usual one: none is marked and we are reliant for attribution on museum specimens, in this case in Keighley's Cliffe Castle Museum. The author believes he has found a third, previously unrecognised Yorkshire maker but that presents its own problems: see later. Wibsey Pottery was established by the Tordoff family as a slipware pottery some time before 1770 but changed hands 1780-81, the lease passing to Isaac North & Son. Opinions seem to differ as to when pottery production had ceased, dates of 1825, 1830 and 1840 having been seen. Most (all?) published information appears to be based on an article published in the April 1929 issue of Connoisseur Magazine (Click button to view). The items illustrated by Connoisseur Magazine are mostly unsprigged and seemingly indistinguishable from contemporary Derbyshire products. Keighley Museum attributes the following sprigged items to Wibsey (Click image to view). The heavy sprigging is distinctive. The Manor House potteries at Eccleshill were established by Jeremiah Rawson, Lord of the Manor, about 1835-1837. He is reputed to have brought throwers from Staffordshire, with wheels and moulds. Sometime around 1848, the site and mineral rights were acquired by William Woodhead, who continued to make high quality salt glazed wares until 1867 when the pottery closed and was turned over to brick and chimney pot manufacture (information from Keighley Museum). The museum has a number of examples possibly acquired directly from members of the owning family. All items are very similar to contemporary Chesterfield production and a detailed examination of sprigs is probably need to distinguish between them. Keighley has a very large jug with variants of the standard toper sprigs around the top which may aid identification. A number of items in the V & A’s Browne Muggs exhibition are attributed to Eccleshill based on sprigging (often derived from Staffordshire originals) found on pieces in Keighley. All the examples shown here are in Keighley Museum. Thomas Stephen Russell was the manager of the “coarse ware” pottery operating in conjunction with David Dunderdale & Company’s Castleford Pottery. Castleford’s white stoneware (tea pots, sucriers, jugs etc.) are so well known that “Castleford” has become a generic name for such items. 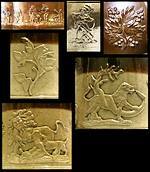 They also made creamware and pearlware but the “coarseware” output has largely been ignored. When the Dunderdale partnership broke up in 1821 and “fineware” manufacture ceased, Russell (the son of a Dunderdale partner) continued in operation. 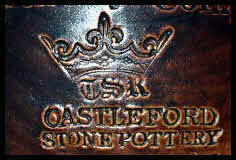 A small number of spirit flagons marked Castleford Stone Pottery TSR have been recorded together with an even smaller number of stoneware porter bottles. A recent discovery is a well made tankard with the base marked with the crowned TSR mark and the name Thomas S. Russell. This can be linked to an unmarked jug. Both of these use sprigs that were also used on marked Dunderdale & Co. teapots. We can also link them to a host of other items both with individual sprigs and with Brampton type continuous hunting scenes. However this is where the previously mentioned problems arise. Many of these other (unmarked) items must have been made after Russell gave up the pottery (late 1830s?). 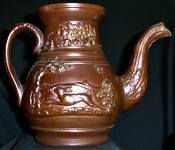 The pottery itself passed through many hands and continued in operation until (as Hartley’s Pottery [Castleford] Ltd) it finally closed in October 1960. The aforementioned “host of other items” include examples that date from the late 1860s and are marked “Doulton Lambeth”. It would be convenient if Doulton had acquired facilities in Castleford and hence their moulds and sprigs but this does not seem to be the case. A lot more research is needed to determine if all of the “host” are actually from the same source.